We need your help getting our message out! 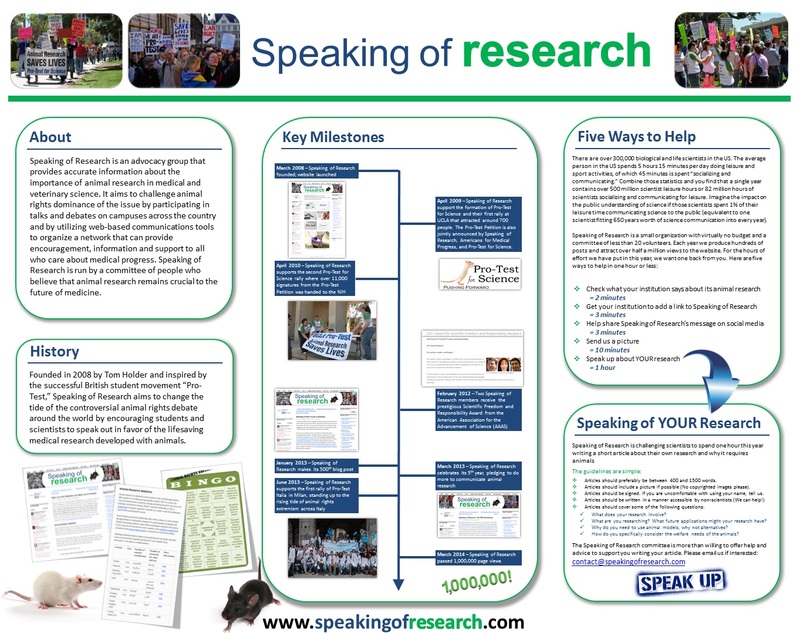 Speaking of Research need your help. We want to raise $200 this year to help us pay our website costs, with a little left over for promotional activities (printing leaflets, briefings and the occasional poster, as well as online promotional work). 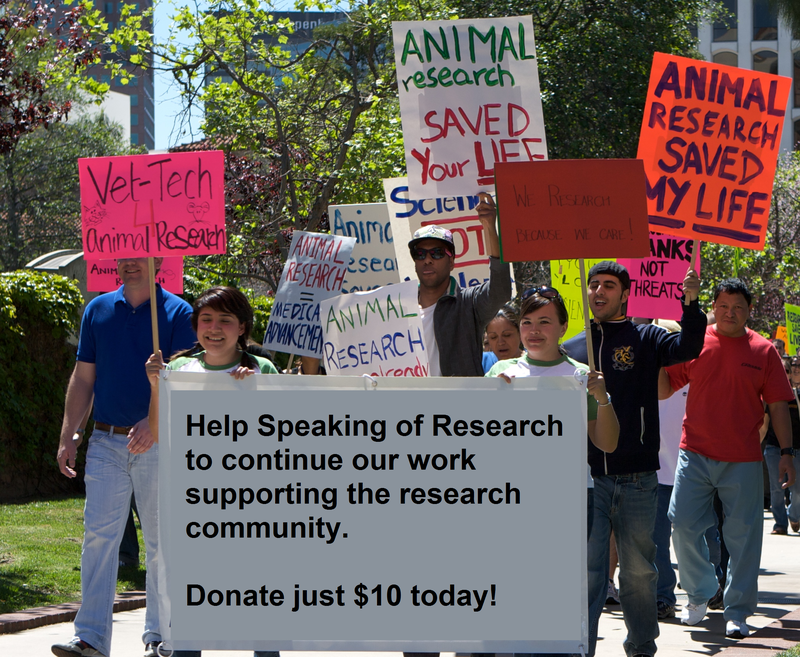 Donating up to €10/£10/$15 is a huge help to our efforts in explaining the important role of animals in medical and veterinary research. Been on TV seven times, radio on sixteen occasions, and been quoted or included in over 30 news articles. 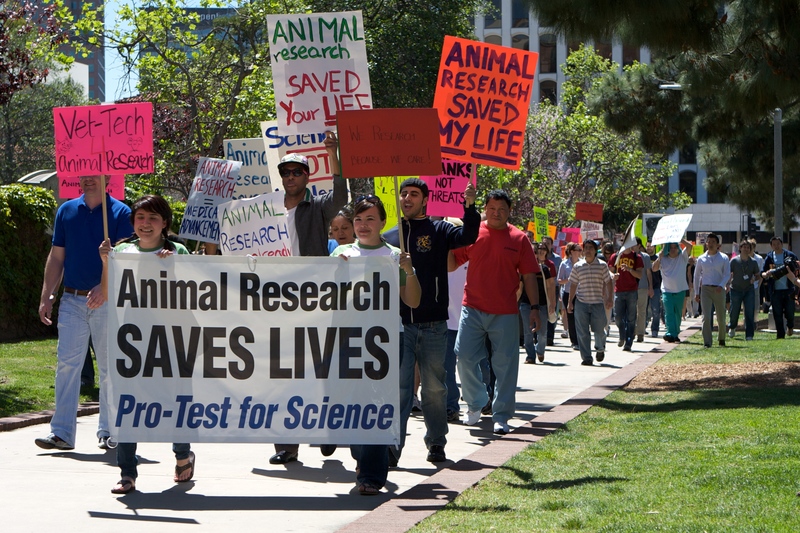 See examples of Speaking of Research in the media. While our committee does not ask for any money for their efforts, our web hosts do. In 2014/15 we spent around $150/yr on website related costs (and some more on our AALAS poster); this was provided by numerous small donations made by our supporters. We are asking for small individual contributions (up to $15/€10) so we can continue to grow in 2015/16. Any money we receive, above what is needed for the website costs, will go towards other online activities such as promoting posts on various social media platforms in order to boost our readership. Click the Donate button below. Some people have had problems making donations by debit/credit card. If you find changing the country from UK does not change the British “provinces” (to, say, US “states”), try picking a random country first, wait for it to change the menu options, then change to your chosen country (and wait a few seconds). This should work. Posted on April 25, 2016 by EditorPosted in News, SR NewsTagged donate, speaking of research, website. Over half way to our target – massive thanks to all seven donors! One quarter the way there thanks to three kind donors in the first few hours. Thank you so much!